or Other various 18mm bullion rounds. These presentation case have a bedding area with three coin placement areas. 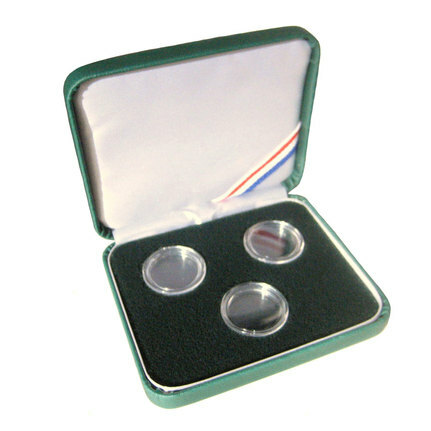 Each of these coin placement areas is made with a plush velvet material and measures 26mm which will accommodate a 18mm airtight acrylic capsule. This case is also made with a very sturdy tension hinge that opens/closes like a ring box and will help keep your collection pieces in top condition. No waiting 3 to 4 weeks for your order here. All purchases are shipped the very next business day after payment has cleared, We Stock everything we have listed WE DO NOT drop ship anything! PLEASE NOTE: Be Sure to check your bullion size we will not accept returns on airtight capsules and protective cases because they wont fit, All sizes are listed in our listings Thank you.